On Thursday, May 10th, we offered our second Create a Commuter workshop to the Portland Opportunities Industrialization Center (POIC). At POIC, they reconnect alienated, at-risk youth affected by poverty, family instability and homelessness; with high school education and career training. We had 14 excited young adults arrive on a perfectly sunny afternoon at the Church of Christ, who generously donated their space to us for the five hour class. This was wonderful, as they had a main floor room that we could just roll in and out of without having to carry the bikes up and down any stairs. Since the weather was so great, we were able to teach over half of the workshop outside on the front lawn, which also gave the students more space to do their full bike safety checks before the first ride. We rode an eight block loop for the first ride, allowing everyone to get comfortable on their new bikes, and to make sure that their seats were adjusted properly. After the shifting, handling and rules of the road lessons, we embarked on our longer ride with three additional staff from POIC helping us along the way. We rode down the Going Street bike boulevard all the way to 17th and headed up to our bike shop on Alberta where DGK, our Retail Sales Manager, gave them a wonderful tour of the main shop and the production space. The Create a Commuter participants thanked all of staff and volunteers who were there working on bikes and looked at all of the accessories that they could purchase for their new bikes. 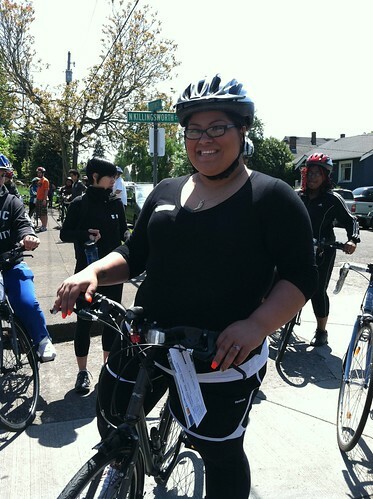 We had a nice ride back to POIC on the Holman bike boulevard, and every rider made it all the way back with smiles on their faces! We ended the day with some flat tire and route planning lessons, then the participants went back across the street to the POIC building to show off their new bikes to their peers, before riding them home. All in all it was an awesome day, and we created 14 new commuters, who I am sure will be riding their bikes all around Portland this summer!